Here in Akita, it is just June-like weather lasting these days, when I visited Kisakata(象潟) Basho visited on August 1, 1689, on his journey. Basho and his party are said to have taken a boat out on the lagoon on Kisakata They put in first 能因島 (Nohin jima), Nohin Island, where they called at the remains of the hut in which 能因(Nohin)(988-? ), a waka poet, lived in seclusion for three years. After that, Basho and his party left for the opposite shore, where they landed from their boat, and they saw the cherry tree that stands as a memento of 西行法師(Saigyo hoshi)(1118-1190), Saigyo. Then they called at the temple standing nearby. In those days it was called the Ebb-and-Flow-Pearls Temple(干満珠寺)(Kanman ju ji), which is now called 蚶満寺 (Kanman ji), the Kanman-Temple. 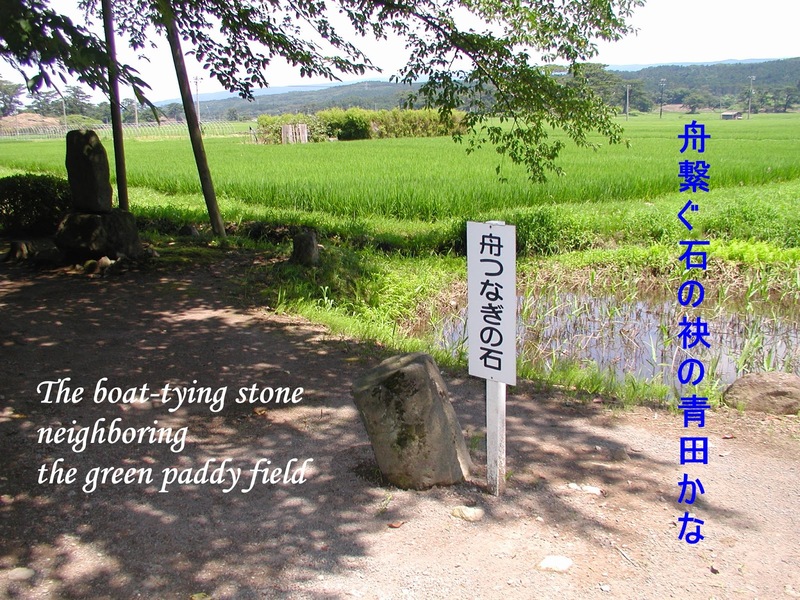 My photo and haiku are about the present-day Kisakata. 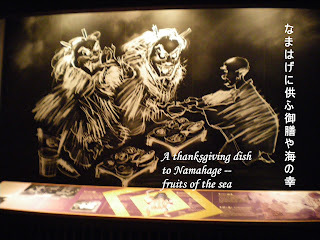 Namahge give performances through sacred music and dance in the festival. The Oga people have coexisted with nature, inventing drama between human beings and the guardian deities. Giving birth to a feeling of mystery, the festival presents children something exciting and fantastic. The children gradually develop a sense of affiliation with their community and its culture, while the men who act as Namahage reinforce their identity and the continuity of their longstanding traditions. 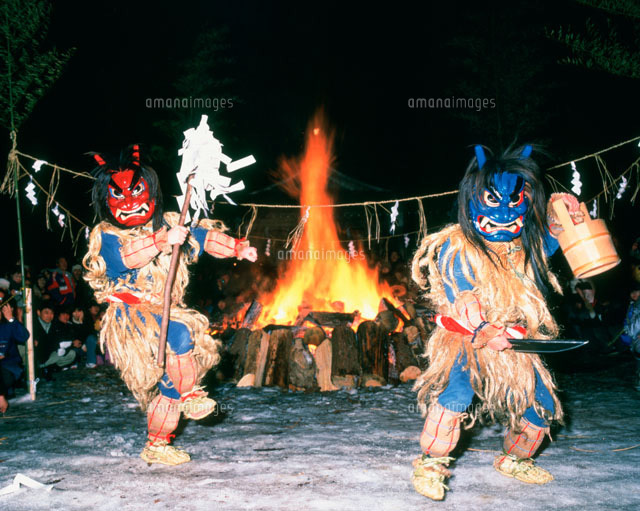 The Namahage Sedo Festival is held on the grounds of the Shinzan Shrine at the foot of Mount Shinzan on the second Friday, Saturday and Sunday of February every year, when the “Devil Festival” on December 31 is re-enacted for the public there. 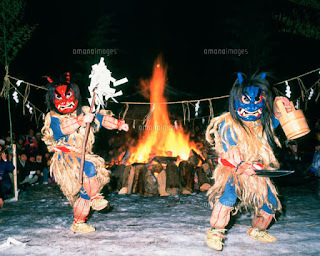 Namahage join the festival as messengers of god in the following way. 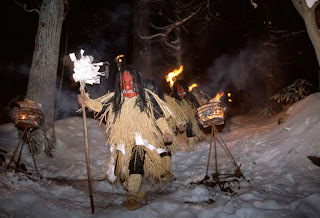 First of all, there is a ceremony in which young men are exorcized and changed into messengers of god with devil masks handed by Shinto priest（神官）, entering Mount Shinzan as Namahage. Next, those Namahage　come down to the grounds of the Shinzan Shrine to take part in the festival. The real purpose of the arrival of the devils is to punish the lazy fellow who does not do his work or help the parents with the house chores. The festival consists of drama between human beings and the guardian deities. It is carried out as tradition and custom in the richness and fantasy afforded people of this part of the world. The figures suddenly rush out of the house to pound on the next door in their frantic scratch for a lazy fellow. When the door is open, the first devil describes himself as the spirit, while the second devil beats upon a wooden bucket with a large cutting knife. The elders of the house receive them and bring the devils into the house and the living room. As the devils walk slowly down the hall way the devil of Namahage will shout in a loud voice. “Where are the crybabies in this house?” Suddenly the devil slides open a door and there will be the children. Namahage will shout. “Are you good children?” “Are you working hard at school?” Of course, the children all nod their heads that they are doing their best. In the Oga Peninsula, Akita Prefecture in the northern Honshu, Japan, there is a deep feeling of mystery as the New Year begins. 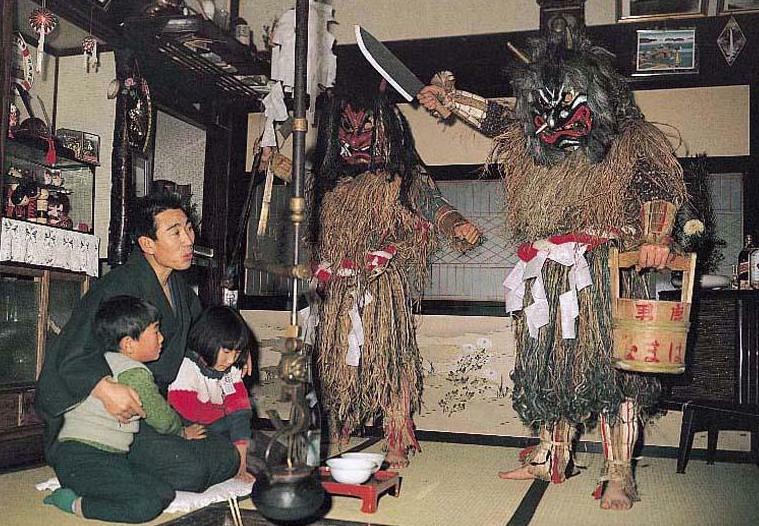 There is the “Devil Festival” held there on December 31, a ceremony that children find exciting and full of thrills. Two or five young men dressed in straw rain capes, large straw boots and wearing frightful masks run as fast as possible through the village in the snow and shout in a monster-like voice as they knock upon each door. On November 2, 2015, Hidenori Hiruta visited the Tokkō Peace Kannondō (特攻平和観音堂) when he went to Chiran Peace Park, in Chiran, Kagoshima Prefecture, Japan. The Tokkō Peace Kannondō is a temple having a statue of Kannon, the Buddhist Goddess of Mercy inside. The image enshrined within is a 0.58m replica statue of the Yumechigai Kannon (夢違観音 Dream-Changing Kannon), a National Treasure at Hōryū-ji. The names of the 1,036 kamikaze pilots are written on paper within her womb.